When will I learn that if I just give God some space to work, I am changed? I just experienced one of the most amazing weeks of my life. And these wind turbines started it all. 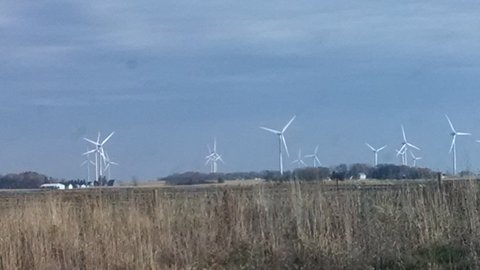 I was driving from Lawrence, KS, to the American Baptist Assembly, Green Lake, WI, when I noticed these tall, magnificent machines. It was like they plopped down in the field all at once. Which, of course, they didn’t, but that’s the way it seemed. Then, I looked on the other side of the road and saw another field. I was surrounded by power. Wind power. Spirit power. These three-armed machines were being moved by something that I couldn’t even see. At the time, I couldn’t even feel the wind against my car. But I knew it was there. The proof was in the movement of the arms. It seemed almost magical. What it was, was holy. One turbine can power about 500 homes, according to one source I read. But when you have a whole field of them, the power creates light and activity for a whole community. Again, like our walk with God. Alone, we can share some of God’s power, but when we are community, look out world! That’s God’s plan, anyway. But it doesn’t always happen that way. When we look at a field of wind turbines, we notice that some of them aren’t turning. In every field I saw, I found that to be the case. The “natural” state is for the arms to turn with the power of the wind and create electricity, but sometimes the “brakes” are engaged, and it stops turning in the wind. The wind of God’s Spirit can be stopped by—or at least slowed down by—the “brakes” we engage. Maybe we engage them because we are scared of the power; maybe we engage them because we want to be in control; maybe we engage them because we’re tired, or lazy, or . . . . Well, you get the idea. We can’t control God, but we can put the brakes on allowing God to breathe into our lives. The image of wind turbines as the way I relate to God have become important to me in my daily walk with God. I have more to learn from this image, I know. This entry was posted in Personal Narrative and tagged devotion time, Holy Spirit, wind turbines. Bookmark the permalink.